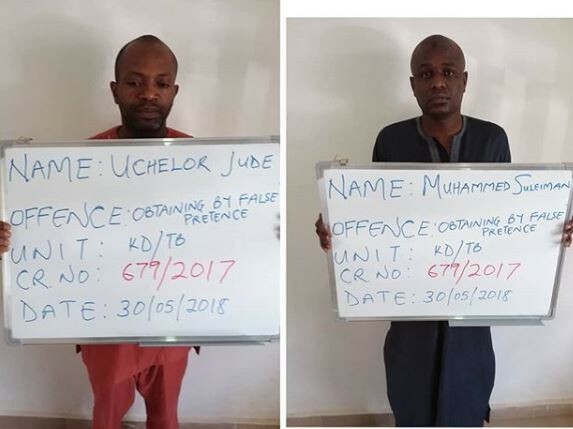 The Kaduna office of EFCC on Friday, June 1, 2018 arraigned the duo of Muhammed Suleiman and Uchelor Jude before Justice M.T Tukur of State High Court Kaduna on a two count charge bordering on obtaining money by false pretence. The alleged serial fraudsters conspired among themselves to defraud unsuspecting victims’ huge sums of money amounting to over 10million Naira by using eighteen different bank accounts after intimating them that they have secured a drainage construction contract purported to have been awarded by the Kaduna State Government to Gilmore construction Company. Count one reads that you Muhammed Suleiman ( AKA Muhammed Alhaji Hamza) and Uchelor Jude sometime between 2016 and 2017 in Kaduna State within the jurisdiction of the High Court of Kaduna State conspired among yourselves to do illegal act to wit: obtaining money by false pretencce from one Anthong Chidozie the Managing Director of Pavatek Global Resources Limited and thereby committed an offence contrary Section 8 (a) of the Advance Fee Fraud and other Fraud Related offences Act, 2006 and Punishable under Section 1(3) of the same Act. They pleaded not guilty to all the charges against them. In view of their plea, prosecution counsel, Sa’ad Hannafi Sa’ad requested for a date for commencement of trial, while praying the accused to be remanded in prison custody. In his ruling, Justice Tukur directed the accused to be remanded in prison custody and adjourned the case to the 6th of June for hearing of bail applications.